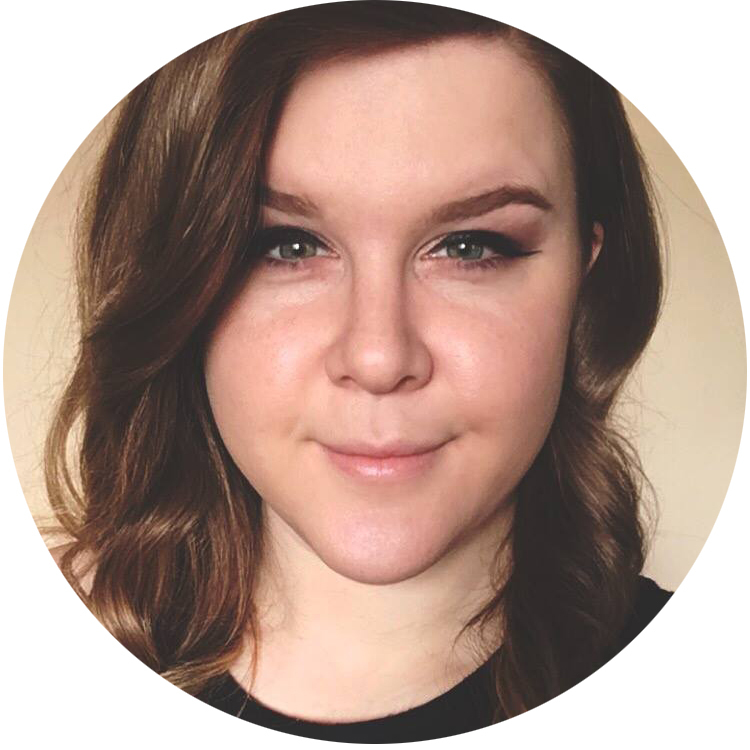 I've received a bunch of questions about my nail art tools lately, and to answer them, I thought I'd make a post! Here's the short of it: I use the MASH 15 piece nail art brush set for my nail art. It was gifted to me by a friend as part of a "Secret Santa" type exchange, but you can find this set on the MASH website! The kit comes in this nice black storage case. All of the brushes except the fan brushes come with protective coverings. The case folds up neatly for on-the-go painting or simple stowing. 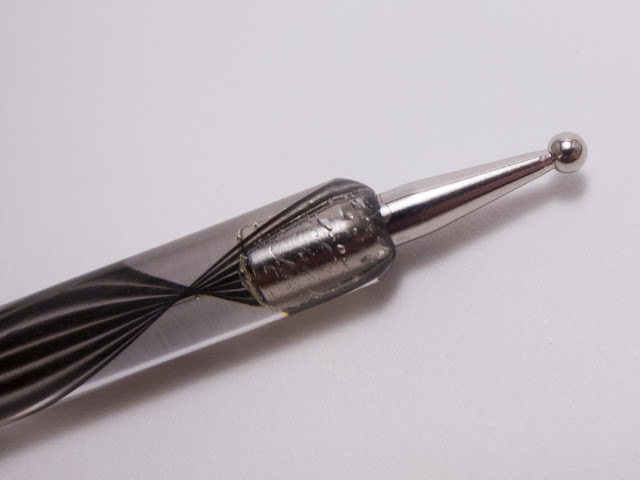 The brush below is the one that I use for 95% of all of my nail art! It's a medium length striper brush. I have set it next to this snazzy 1999 dime for size reference. The length is just long enough to be precise but not so long that it is difficult to control. The kit also has lots of other neat things! 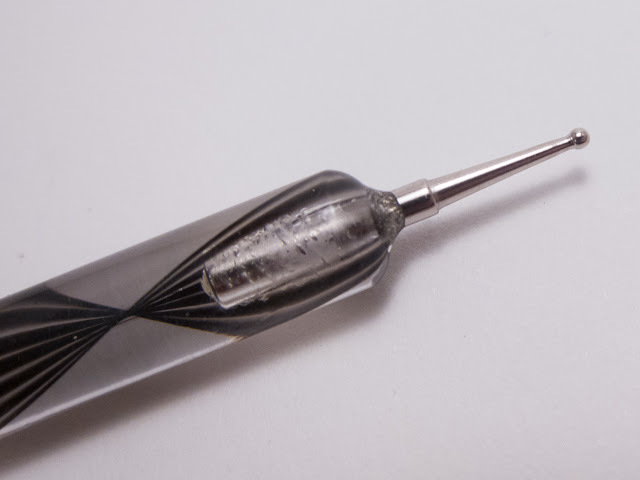 For example, it has this pinpoint dotting tool, which creates a much finer dot than most standard dotting tools. 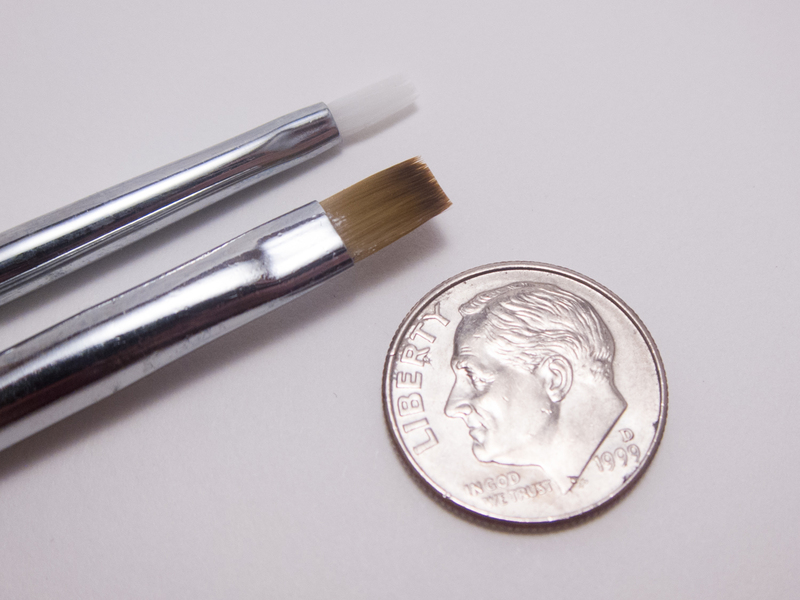 It also has a few longer striper brushes, which I personally find harder to control but would be really good for very fine lines. 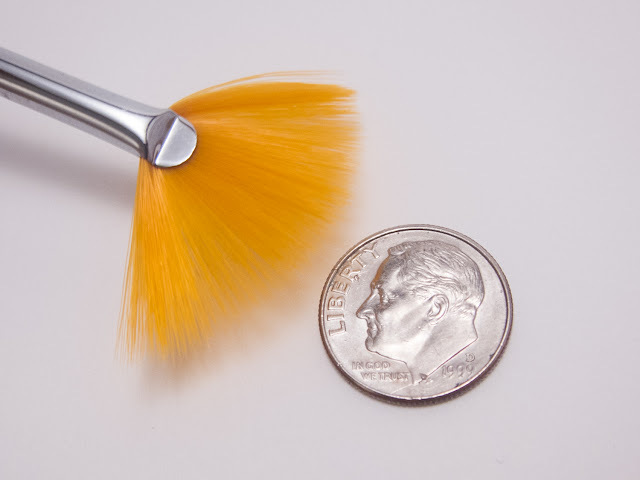 The kit has two fan brushes, one of which I have shown here. I've never tried the technique, but you can use fan brushes to create interesting effects like the one in this tutorial from Neverland Nail Blog. There's more! 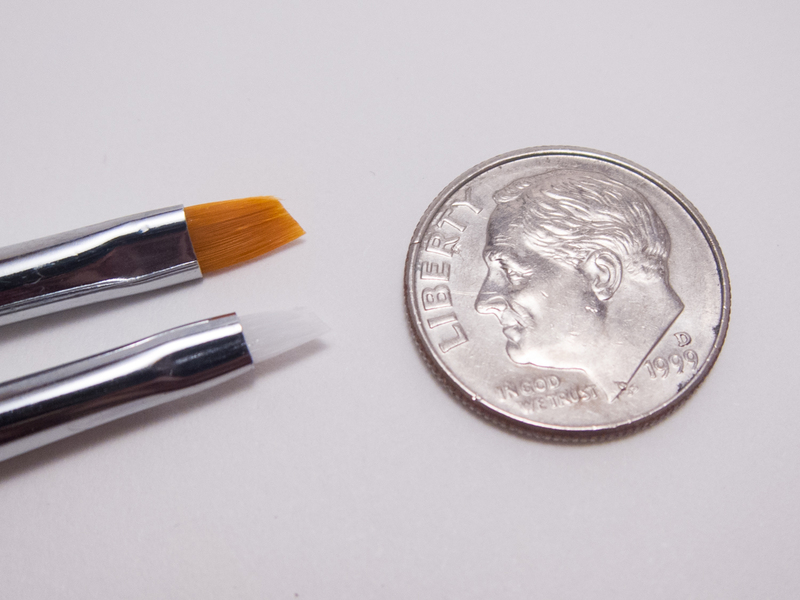 This last brush photo I have here is of some of the angled brushes, but this isn't even the end of the kit! There are more brushes in the set, like some short detail brushes and a bent handle brush. In addition to the brushes, I use dotting tools all the time. They aren't just for making dots, though of course they do that very well. I use dotting tools for my leopard prints, ruffle manicures, and even the eyeball nails that I did last Halloween. ...and here is a small ended dotter! 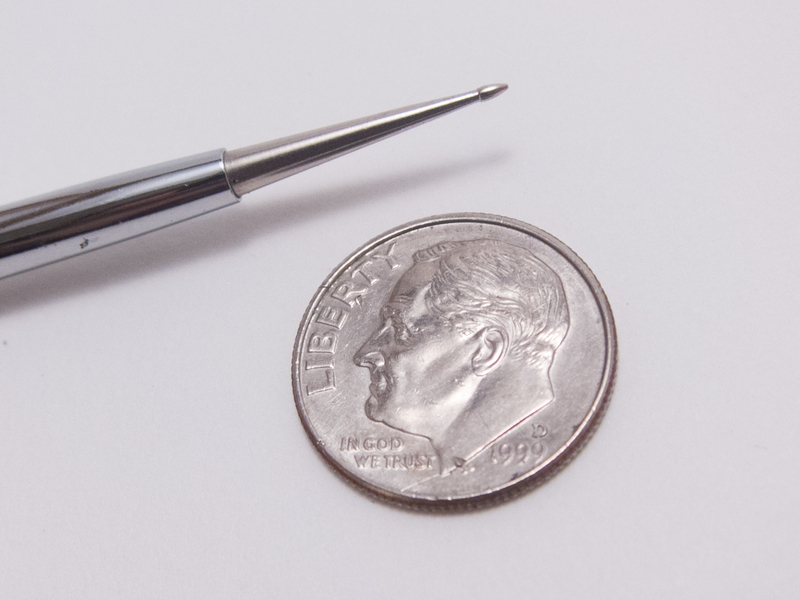 Oftentimes, you will find a single dotting tool that has both a large and a small end. Again, if you'd like to purchase these specific tools, you can find them on the MASH website. Don't miss the giveaway after this jump! The kind people at MASH have provided two prizes for me to pass on to one lucky winner. 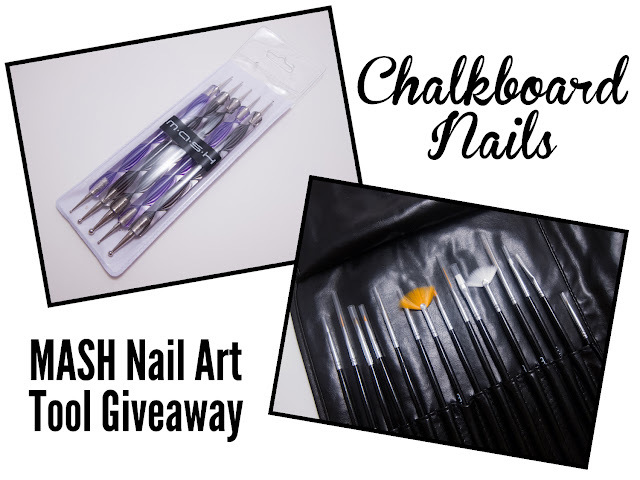 The winner of this giveaway will receive a set of five dotting tools, which include large, small, and pinpoint dot capabilities, as well as their 15 piece brush set that I love so much. Must be a follower of CN in some form to win. Please use the Rafflecopter widget below to enter this giveaway. Giveaway ends August 14, 2012 at midnight. When a winner is selected, they will have 48 hours to respond and claim their prize. If they do not respond within the given timeframe, a new winner will be selected. Open internationally. I've been wanting those MASH dotting tools for so long! I love the colors. Thanks for the giveaway. Also, what do you use to clean your brushes? I clean them as gently as possible with pure acetone and dry them off on a cotton round. Well that's easy enough! 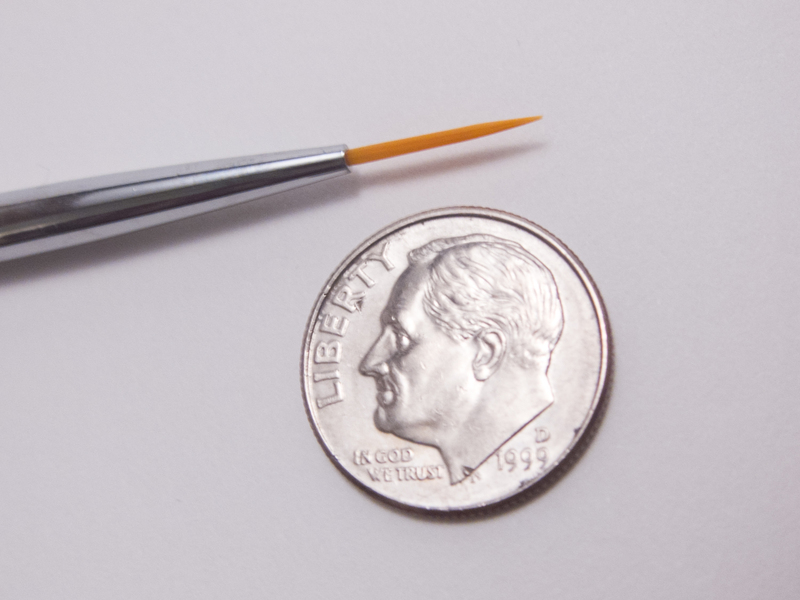 I only have a couple cheap brushes right now that I've cleaned with remover or thinner at times. Wanted to find out what was best so when I get a nice set I wont ruin them! Thanks for answering so fast, I probably would have forgot to check back later! Yeah, I'm a creeper like that sometimes! Thanks for such a cool giveaway! I just recently started working at a job where I could actually paint my nails, and I started following your blog for design ideas! You have such a talent and I always love what you come up with! I looooooove my MASH brushes. I've been so intrigued by the fan brushes but never dove in. Might want to try them out soon! Omg best give away ever!! 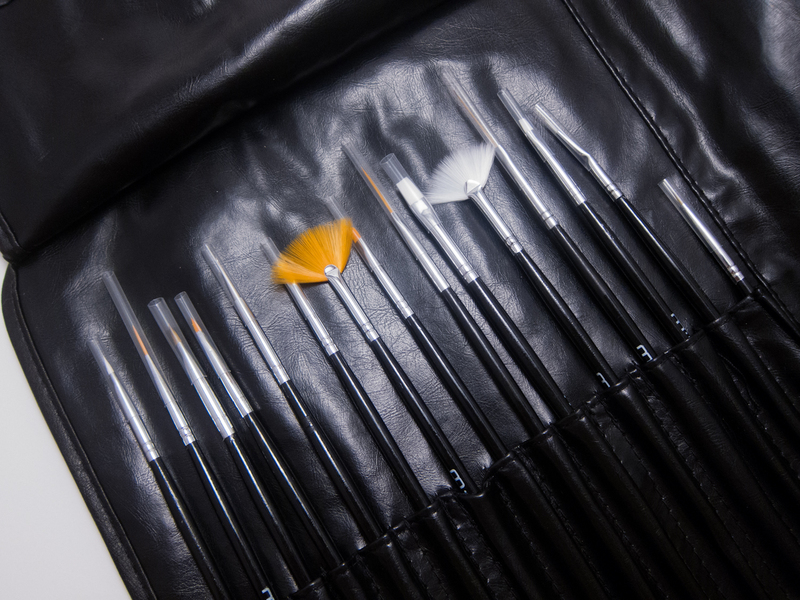 This is the brush set I use too and I love it. 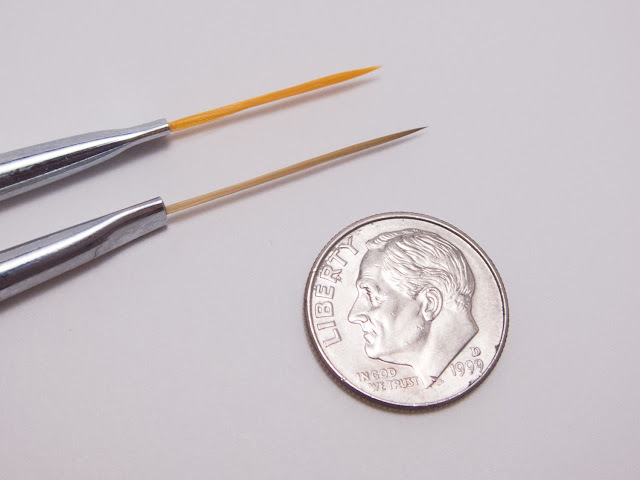 When I say this is the brush set I use, I mean that this is the set I own that contains the one mid-length striper I use for every single thing I do, haha. I was just looking at this brush set on Amazon yesterday! Awesome giveaway. Terrific giveaway, I have had this set wishlisted for awhile! I have a brush with the bent angle and it makes drawing so easy to manipulate that I wonder if I can even do it with the straight ones. I don't have any official nail art tools so far, just stuff I find around the house. Thanks so much for hosting this giveaway! I always wonder about tools other nail artist use. You are fantastic, very talented. Great giveaway! Wow that one stroke video is amazing! They make it look so easy. Will definitely have to give that a try. This is such an amazing giveaway :) The brushes look amazing! Wow great giveaway. Thank you CN and MASH. I'm sitting here thinking of all the things I could do with these tools. This is an awesome giveaway! Polishes are nice to win of course but the tools to play with those polishes is equally important!